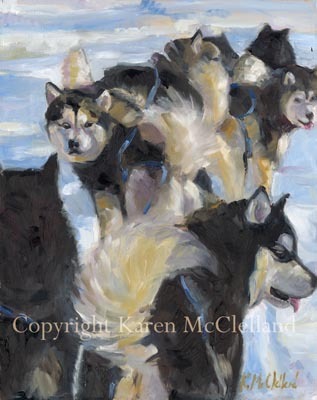 Alaska Malamute Dog limited edition giclee art print, dog painting done by artist Karen McClelland titled "Let's Go!" Original oil on canvas 20" x 16" framed $800.00. Alaska Malamute Dog print titled "Let's Go!" You can just read it on their faces when the team looks back at the driver. They're wondering why did we stop, and let's get going again?.